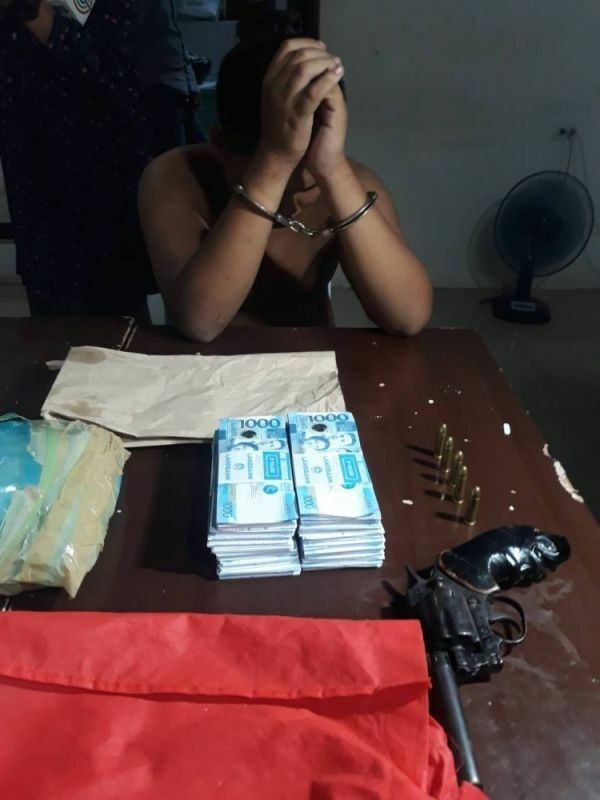 A GRADE 11 student of a public school in Cebu City was wounded in a drug bust conducted by the Regional Special Operations Group (RSOG)-Central Visayas on B. Aranas Ext. in Barangay San Nicolas Proper at dawn Sunday, March 24. The suspect was identified as 18-year-old Michael David Marzon de Gracia, a resident of Sitio Mansanitas, Barangay Duljo-Fatima. Seized from him were three kilos of white crystals believed to be shabu with an estimated street value of P6.8 million. RSOG-Central Visayas Chief Ricardo Tero said de Gracia was on their list of high-value targets. When the suspect noticed he was dealing with the police, he tried to escape on his electronic bike, but he was cornered by police and tanods. He pulled out his revolver and tried to shoot the arresting officers. An operative shot him first, hitting him in the lower limb. A tanod wounded during the commotion was later declared out of danger. In an interview with Superbalita Cebu, de Gracia denied any involvement in the illegal drug trade. “Dili man to akoa. Ambot kinsa kaha nang shabu kay wala man ko magdala ana (The shabu was not mine. I don’t know who owns it since I didn’t bring it),” he said. De Gracia said he often visited B. Aranas Ext. after a fire razed his family’s house in the sitio last year. The suspect said he was willing to undergo a drug test, adding that it would yield a negative result. However, the RSOG-Central Visayas official insisted it was de Gracia who sold the shabu to a police officer posing as a junkie. Tero said they had placed de Gracia under surveillance for weeks and were able to confirm his illegal activities. Aside from shabu, the RSOG team also seized a loaded .38 revolver from the suspect. Meanwhile, San Nicolas Proper barangay captain Clifford Niñal said some drug personalities from Duljo-Fatima had transferred to his barangay. He had directed his tanods to monitor suspicious persons, who may be involved in drug-dealing activities. The tanods and personnel of the Sawang Police Station assisted RSOG during the operation. According to Niñal, the barangay will mount security cameras to help police monitor drug pushers. In Talisay City, police have yet to determine whether the fatal shooting of a couple was drug-related. Carol Dixie Bacalso, 28, and her 30-year-old live-in partner Felix Yaris were gunned down while riding their motorcycle on Rabaya St. in Sitio Matinagdanon, Barangay Tabunok on Sunday. The victims were both city residents; Bacalso from Barangay Tanke and Yaris from Barangay Poblacion. Witnesses said two men on a motorcycle shot them around 3 a.m. The couple were on their way home from a bar. “There are reports that illegal drug transactions are made inside the bar where the exchange of money and drugs are rampant. Bacalso is on our watchlist because we have information about her that we continuously validated prior to the incident,” said Chief Inspector Ardeolito Cabagnot, deputy chief of the Talisay City police. He said the target was Bacalso since the gunmen were intent on killing her. They even went back to make sure the victims were dead. “She may have owed someone money because why would they (the couple) purposely go every Friday and Saturday to the bar if they’re from Tanke? She gets the shabu there and sells it in Tanke,” he said in Cebuano. Cabagnot said neighbors had noticed changes in the victims’ lifestyle. “Previously, we encountered reports from concerned citizens about Bacalso’s alleged drug involvement. One of their neighbors also told us that the couple suddenly came into money even though they reportedly were jobless,” he said in Cebuano. “But we think it’s a deeper motive, so our investigation will lean more on illegal drugs,” he said.